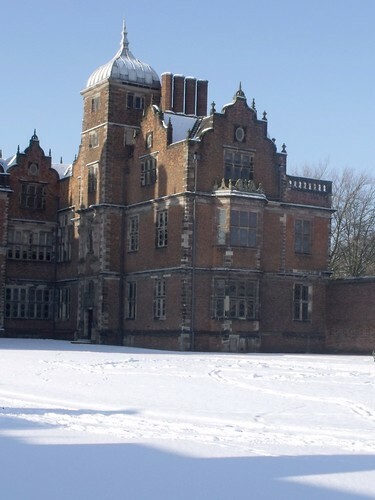 This is Aston Hall, including all the buildings as viewable from the front. It looks amazing with all that almost perfect snow. It is a Jacobean style mansion. Construction started in 1618 and was finished by 1631 when Sir Thomas Holte moved in. It was designed by John Thorpe. It is a Grade I listed building. It was damaged by Parliamentary troops in 1643. The house was built for Sir Thomas Holte and it remained in the Holte family until 1817, when it was sold and leased to James Watt Jr, son of the world famous James Watt. The house was purchased in 1858 by a private company (the Aston Hall and Park Company Ltd) for use as a public park and museum. After financial difficulties it was bought by the Birmingham Corporation in 1864 becoming the first historic county house to pass to municipal ownership. Washington Irving once visited it, who wrote about it as Bracebridge Hall, taking the name from Abraham Bracebridge, husband of the last member of the Holte family to live there. with darker brick diaper, the stone facings and quoins reserved for the corners. out for John Watt the younger, leasee of the Hall in the 1818 to 1848.